UR Biz Needs A Logo! Q. Does someone who runs a small business need a logo? A. Branding is fundamental whether you run a large, medium or small organization, including a home-based business. You need to differentiate yourself from your competitor. For that reason, without question, you need to have a brand identity! Of course, a logo plays a vital role – in creating a unique brand identity for your business. Additionally, a business logo makes you recognizable to customers. The goal is…for instant recognition of your business, name-branding, building & maintenance. Q. How soon should a new business start using a logo? A. Technically, you should secure a professionally designed logo – before you start your business. However, it can be done backasswords, although it’s not recommended. For those who’ve already launched their business with a half-baked logo, the time is now to hire a professional designer, or your make-shift logo and the image it represents may deter potential customers from doing business with you. Take note. If you’re budget is tight, spare the money to invest in a logo early on, and then add branding items as you build. Word of advice. Don’t buy logo-creation software – to do-it-yourself. Besides looking unremarkably chincy, you’ll end up with a logo in limited formats. So, you’ll see pixels when you try to stretch it to a banner size, for instance. Q. What are some design considerations Stern PR keeps in mind while creating a logo? 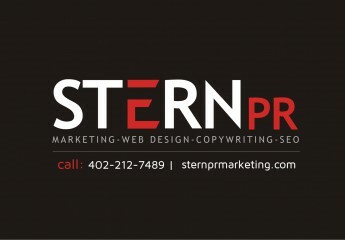 A. Stern PR uses the KISS formula (Keep It Simple Stupid) as a first consideration – in logo design. In addition, it should portray the right message of your business with iconic representation. Fonts and colors should be easily recognizable. Your logo should look great in black and white too. Q. What format should my logo be in? A. Vector based images, made up of a set of mathematical equations (format file extensions including EPS, AI, SWF (flash animation) should be the starting point of any logo design process. A vector image can be scaled, re-sized and rotated without loss of quality. So, your logo will not pixelate or appear fuzzy on an outdoor banner for example. Vector file formats are as follows: EPS, AI, JPG, PNG and GIF. Q. What other formats should I get? A. Beside EPS format of your logo, your designer should provide you with pixel (raster) based versions of your logo including JPG, PNG, GIF. Of all three, PNG and GIF are ideal for logos, offering solid, contiguous colours without ringing, boxing or blurring. Plus, both formats support saving your logo with a transparent background, which is required for your logo to appear on a colored website background – without a white box. JPG’s are primarily used for photographs. – A greyscale (halftone) logo version.